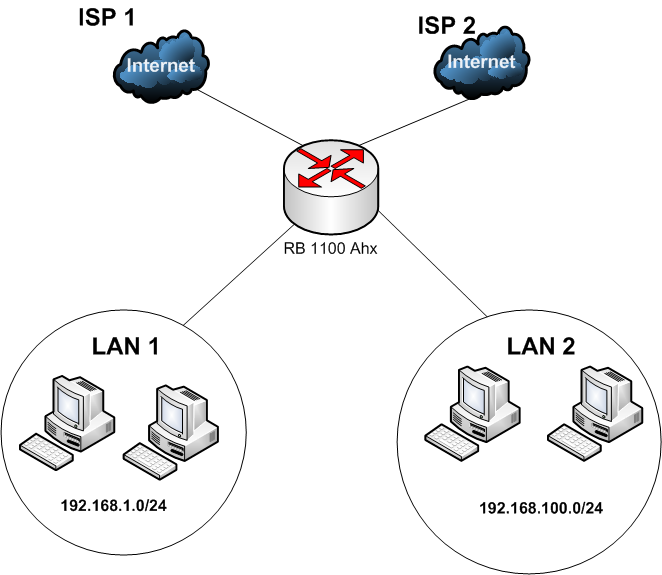 Mikrotik Load Balancing 2 WAN 2 LAN with Failover - Load balance 2 WAN on Mikrotik Router is a technique to distribute the traffic load on the two-paths connection in a balanced manner, so that traffic can run optimally, maximize throughput, minimize response time and avoid overload on one connection path. 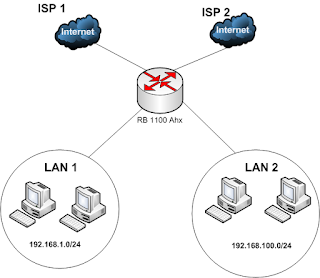 This experiment, I have 2 internet connections different ip WAN and 2 LAN. I've tried it, load balancing and failover can run normally. You can see the mikrotik script below. 2. 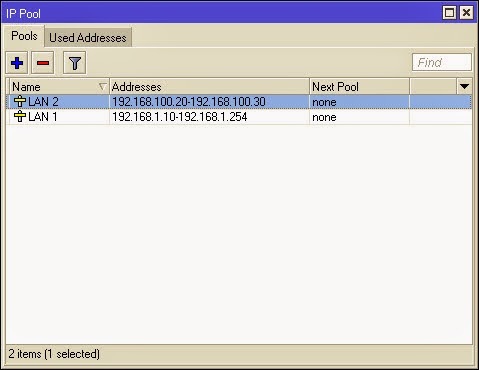 Setting IP Pool to restrict the range of IP that will distributed automatically by DHCP system that we enable. 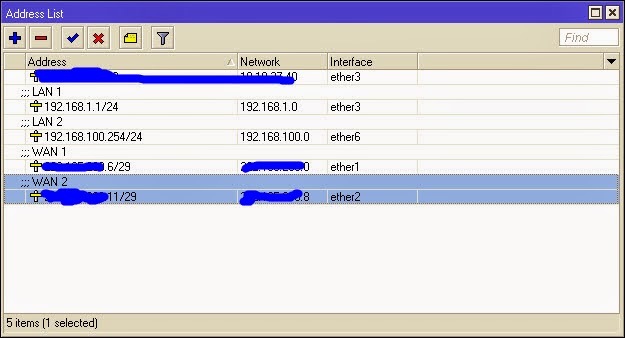 add address-pool="LAN 1" disabled=no interface=ether3 name="staff"
4 Responses to "Mikrotik Load Balancing 2 WAN 2 LAN RB1100AHx"
Hi, I want to do my mikrotik like that, ether1(WAN1) =50Mbps fiber, ether2(WAN2)=10Mbps fiber,& ether3(LAN) for PPPoE server. I've total 250 PPPoE Clients who share internet from the total (50+10=60Mbps)60Mbps bandwidth when both WAN1 & WAN2 are active. When WAN1 is absent somehow, WAN2 will do the backup (minimum connectivity) for the total PPPoE clients. When WAN2 is absent somehow, WAN1 will do the same. What should I do in that case? Please need your suggestion badly. Great document. Now how could i do the same config but with the ISP WAN IP not manual is over DHCP? Great document. Now how can i do the same config but with the ISP WAN IP not manual because it is DHCP assigned. Great! I have 2 WAN and 4 LAN. 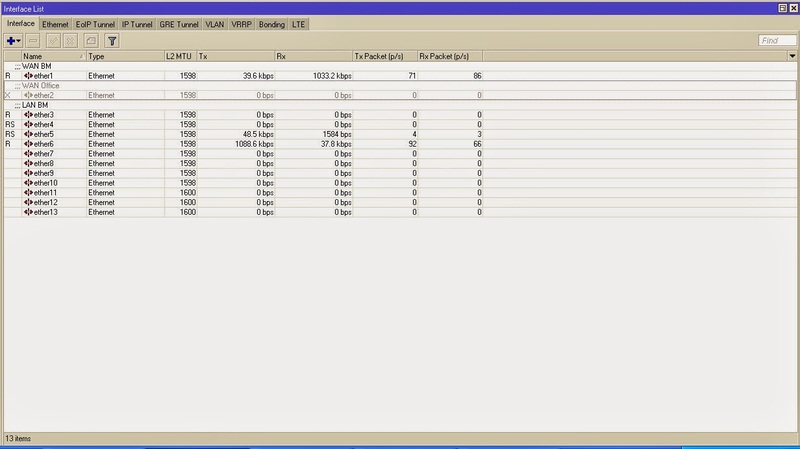 One win server from LAN 2 has to be "seen" on RDP port from LAN 1. I have tried firewall filter rulle "forward", action "accept" from ip address of a server on tcp protocol, port 3389 to wholle addres range of LAN 1, but without success. Without "Load Balance" mangle rulles, I can "see" that server on RDP port. Sorry for my bad English. Thanks!